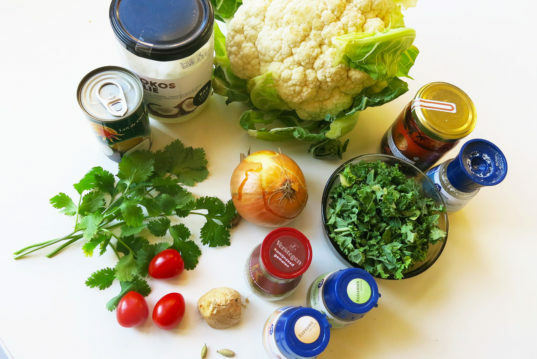 This delicious coconut milk and cauliflower stew has everything we crave in winter: chunky vegetables, warm creaminess and a mix of spices that add both color and taste. The base was made with coconut oil, which is full of healthy fats, slowly cooked at medium heat and spiced up with ginger, cardamom, and turmeric powder, which dyes everything gold. 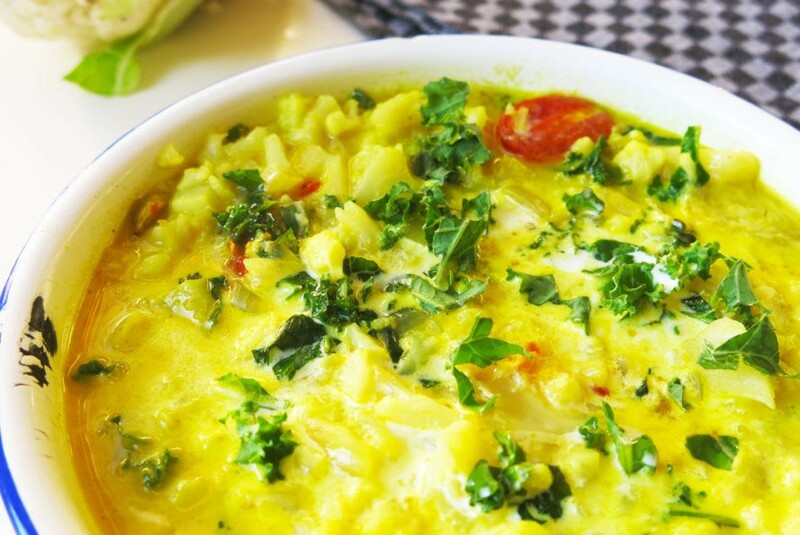 Onions and cauliflower add the most body here, and the coconut milk provides the creamy base. 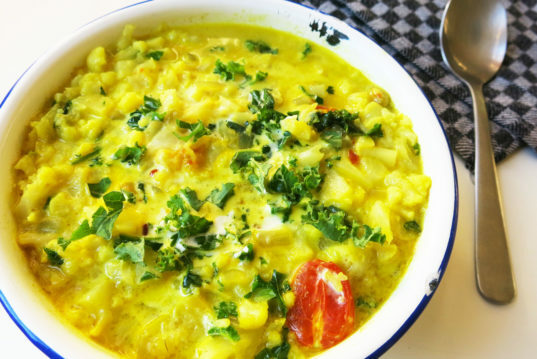 At the end, it looks like it will be too heavy and thick, but then you add a bunch of cherry tomatoes, chopped kale and fresh coriander leaves and voilà, lunch or dinner is served. Medium heat (350°F) two spoonfuls of coconut oil in a stock pot for about half a minute, until it all melts. 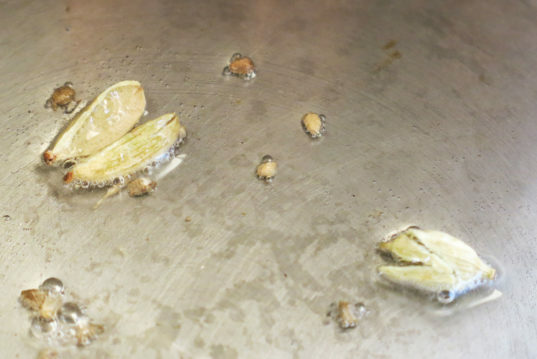 Crush the cardamom seeds with the side of a knife blade and add to the pot, stir until they start to sputter. 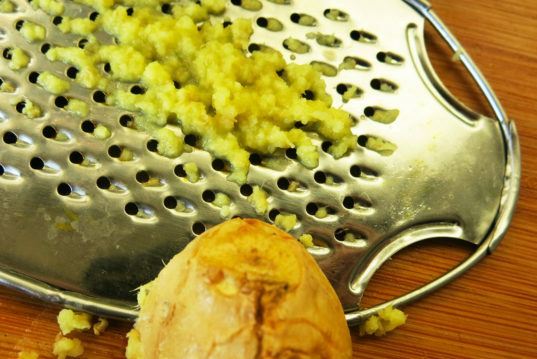 Chop the onions into small pieces and grind the ginger, add both to the pot and stir. Chop the cauliflower and set aside. Once the onions are softly cooked add the coconut milk, but don’t use it all, save some for garnishing. Add the rest of the spices, ground cumin, coriander and turmeric, season to taste, you can always add extra spice at any point of the recipe. Stir and add the chopped cauliflower, add a glass of water. Cover the pan and simmer for about 15 minutes, stirring every 5 minutes to keep from burning. 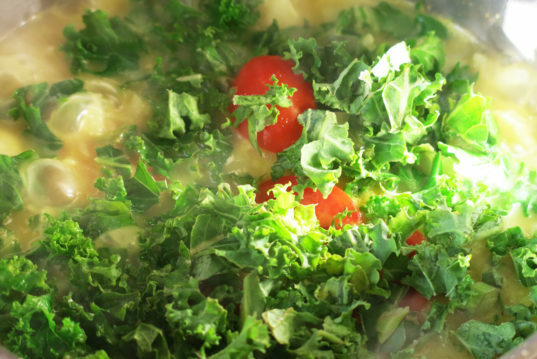 Once the cauliflower is soft add the chopped kale and halves of cherry tomatoes. Turn the heat off and cover the pan. Leave for 10 minutes. Serve as an entree or side dish and don’t eat too much, as cauliflower’s high polyol levels could cause some unpleasant stomach bloating. Garnish with fresh coriander, a dash of chili sauce and extra coconut milk. Enjoy! Once the onions are softly cooked add the coconut milk, but don't use it all, save some for garnishing. Add the rest of the spices, ground cumin, coriander and turmeric, season to taste, you can always add extra spice at any point of the recipe. 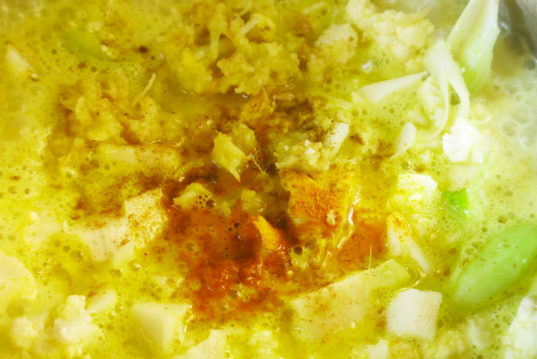 Stir and add the chopped cauliflower, add a glass of water. Cover the pan and simmer for about 15 minutes, stirring every 5 minutes to keep from burning. Serve as an entree or side dish and don't eat too much, as cauliflower's high polyol levels could cause some unpleasant stomach bloating. Garnish with fresh coriander, a dash of chili sauce and extra coconut milk. Enjoy!